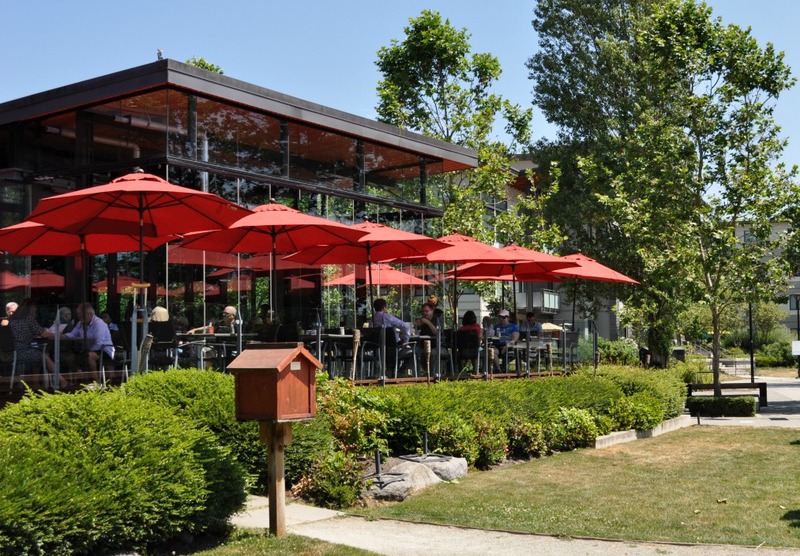 The River District, in Vancouver’s extreme southeast corner, offers a quiet riverside walk, lunch at a good pub restaurant overlooking the water, and a feeling of imminent transformation. The area was identified for conversion from industrial to residential use at least as early as 2004. 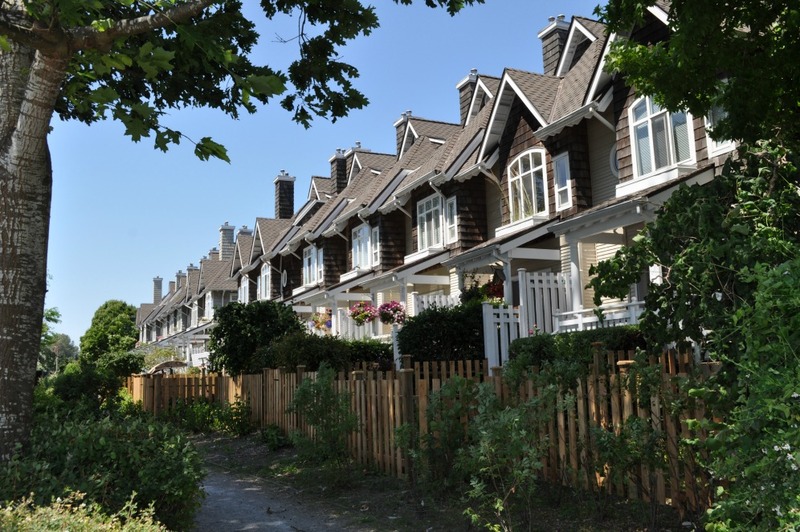 At that time, residential development was already proceeding in a former industrial area to the west, in a two-block-wide band between Marine Drive and the Fraser River. However, most of the lands east of Kerr Street remained vacant — until now. Suddenly, as of summer 2017, wide swaths west and east of Kerr Street are under construction. Among the half-built structures is the start of a town centre that will provide retail and commercial services and jobs. It has taken almost 15 years to sort out land tenure issues, adopt a plan and move through permitting into a major development push. 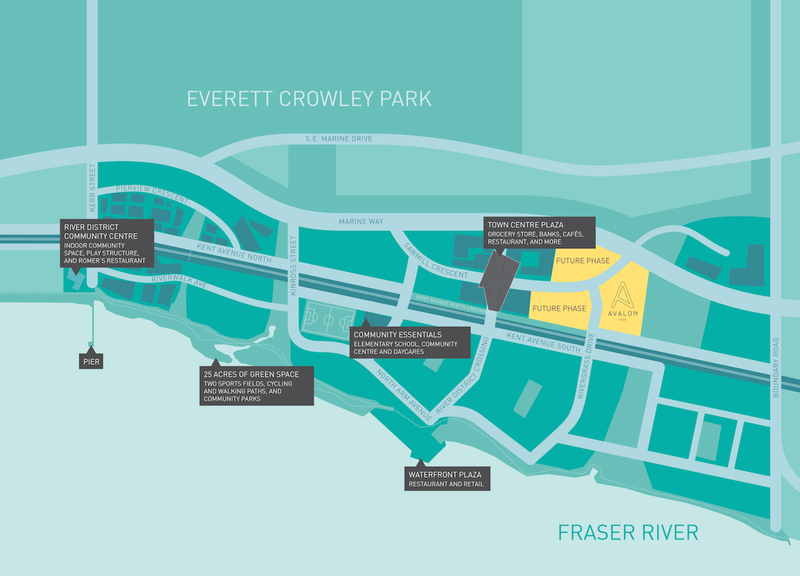 A conceptual plan issued by the River District developer, Wesgroup properties. 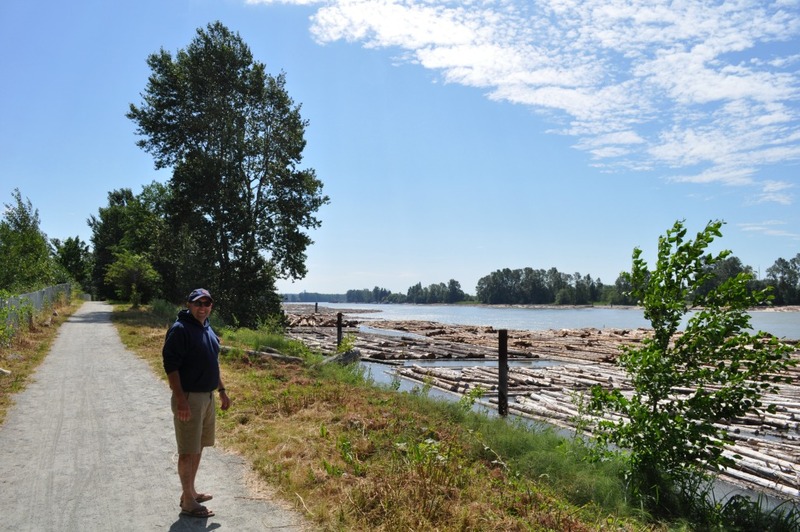 I visited the River District on a Friday morning with co-tourist Robert Smarz of Surrey, B.C. The established streets west of Kerr are shady and architecturally acceptable, but there are no services within a walkable distance, other than the popular Romer’s Burger Bar. 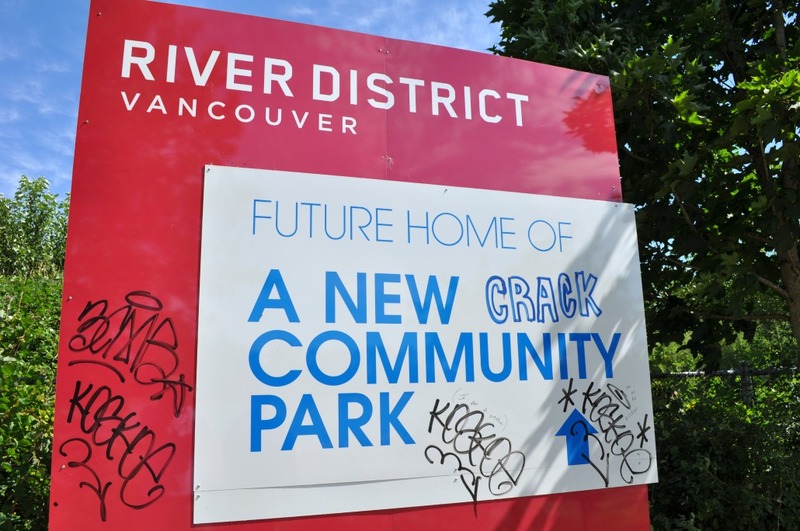 The sense of a sleepy suburbia is amplified by the lack of rapid transit, which may explain why this development zone has grown up much more slowly than many other parts of Vancouver — or Burnaby, or Coquitlam — that straddle the Skytrain system. New town centre services should come on stream in 2018, along with many new residential units. 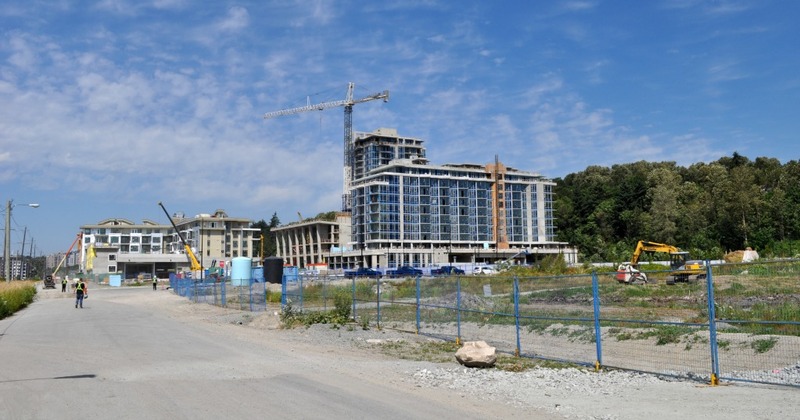 The developer maintains a large sales centre next to the pub in what is to eventually become a community centre, and is also sponsoring a Saturday farmers market on the pavement outside as an added attraction. 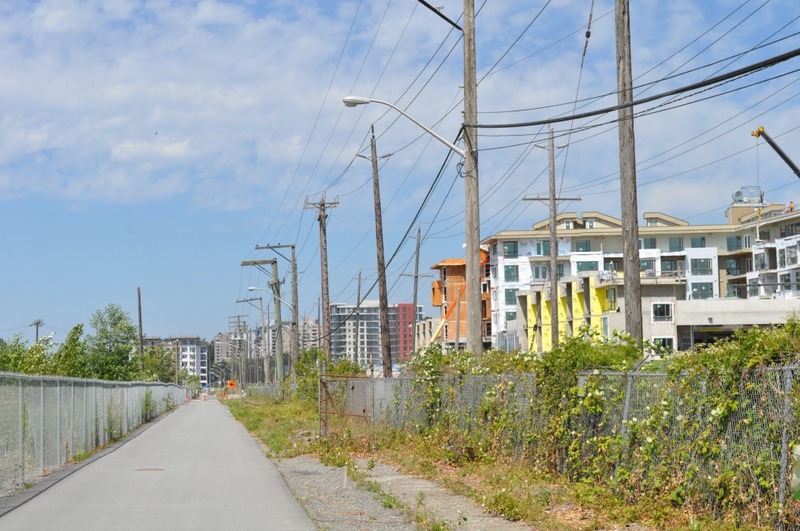 The riverside pathway east of Kerr Street is almost rural in places – for now. 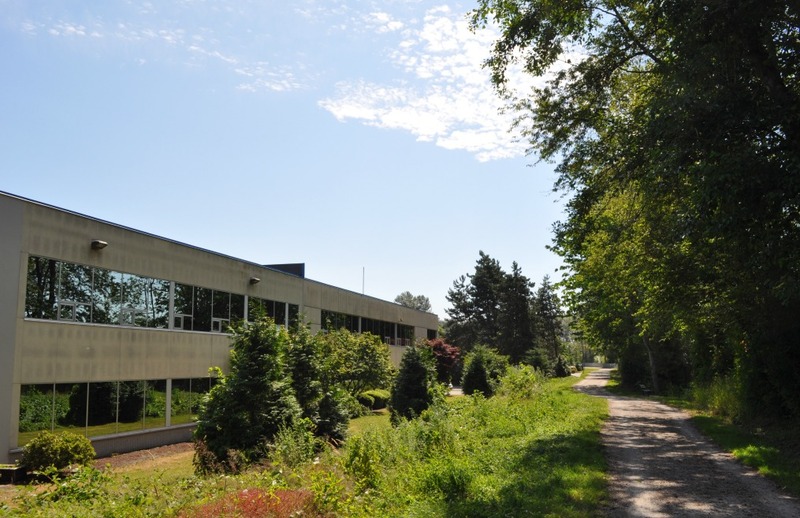 East of Boundary Road, the riverside pathway enters the City of Burnaby and a conventional industrial subdivision. 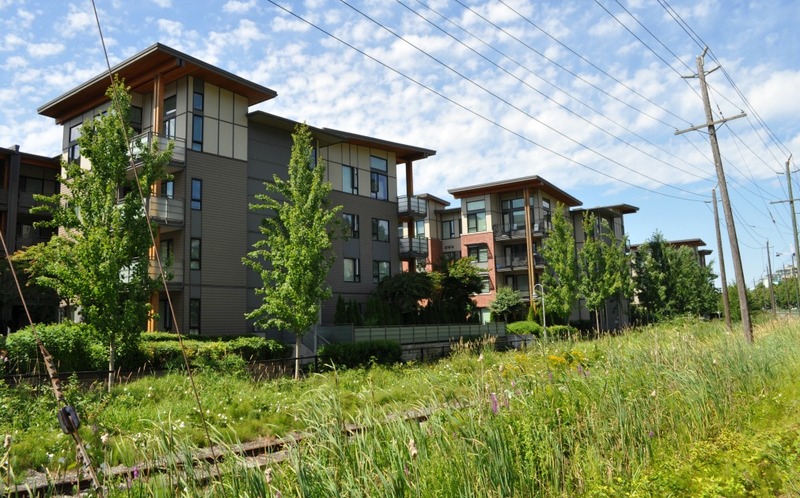 Newer condo apartments east of Kerr Street. The railway track, running through the centre of the River District and the neighbourhood further west, is still shown as active on the CN Rail website. Romer’s Burger Bar. Good burgers. Always fun to be somewhere that could be anywhere.